Electrical systems require periodic maintenance and inspection to ensure power is supplied to buildings and facilities in a safe and efficient manner. That’s why CNA Insurance conducted an infrared (IR) survey using FLIR thermal cameras at a fruit processing facility, where they identified 14 faults that could have started a fire. They discovered one critical, three serious, and 10 intermediate faults. If the problems went undetected, the facility could have lost 100% of its contents—an estimated €3.5 million loss— due to smoke and fire damage in storage areas containing processed fruit. By catching the faults early, CNA Insurance also saved the fruit processor nearly €65,000 in electrical repair and energy costs. While electrical systems are among the most reliable equipment, they require periodic maintenance and inspection to continue to supply power to buildings and facilities in a safe and efficient manner. Section 21.17.5 of the NFPA 70B-2006 edition recommends that building owners complete IR surveys annually. For this reason, CNA Insurance has offered IR thermography surveys to new and existing clients since 2005. Thermal imaging scans decrease the chance for fire loss, reduce energy costs, and help prevent shutdowns of mechanical systems and key production equipment. Traditionally, insurance companies take a reactive approach to property loss that results from equipment breakdown or failure. Lacking a way to prevent them from happening in the first place, they rely on fire-protection systems such as sprinklers to minimize the impact of property losses. But thermal imaging cameras enable insurance companies to find potential problems that the naked eye can’t see—before a breakdown or failure occurs. 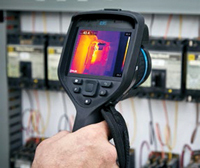 Thermal imaging cameras detect heat that is emitted from faulty equipment in the form of infrared energy. Everything with a temperature above absolute zero releases thermal, or infrared, energy. The light composed of this energy isn’t visible because its wavelength is too long to be detected by the human eye. The higher an object’s temperature, the greater the IR radiation it emits. Thermal cameras cannot only “see” this light, but they can also delineate hot areas from cool areas. Figure 3. IR image showing a critical thermal fault on an electrical conductor at a fruit processing plant. Over a five-year period, CNA’s certified thermographers conducted 6,445 surveys using 22 FLIR thermal cameras, averaging about 100 surveys per month. They found thousands of faults and deficiencies, averaging 7.3 faults per report. CNA Insurance estimates that clients who have had IR scans have saved more than €11 million per year. Based on the typical experience of CNA thermographers, the value of an IR survey is estimated at €1,700. That equates to more than €11 million total value in a five-year period. These IR surveys have saved CNA’s clients an estimated total of €47.5 million in energy savings and electrical repair costs, or a bout €4 saved for every €1 value of an IR survey. But what factors are these estimates based on? These savings include both the electrical repair costs and the recovered energy costs. Electrical repair cost savings are estimated at €432 for minor or intermediate faults and €2,600 for serious or critical faults. 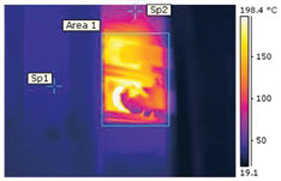 Energy savings can be calculated using a tool called “Indirect Power Calculations from Surface Temperatures,” made available by FLIR and the Infrared Training Center (ITC). Figure 4. Comparison visual image shows charring of the conductor insulation in the area of the thermal fault. The following are considered reasonable estimates: €1.50/day for critical faults; €0.75/ day for serious; €0.40/day for intermediate; and €0.15/day for minor. A cost of €0.15 per kilowatt hour (KWH) is used to develop these estimates, but energy costs may be higher in some areas. CNA Insurance calculates energy savings using 250 working days in a year (estimating 10 holidays) to estimate energy savings for each fault. Insurance loss statistics showed that “average” electrical fire losses were about €173,000 for circuit breakers; €434,000 forswitchgear; and almost €1 million for Motor Control Center (MCC) rooms. A reasonable average electrical fire loss is estimated to be €648,000 based on inflation factors and CNA Insurance’s loss experience. 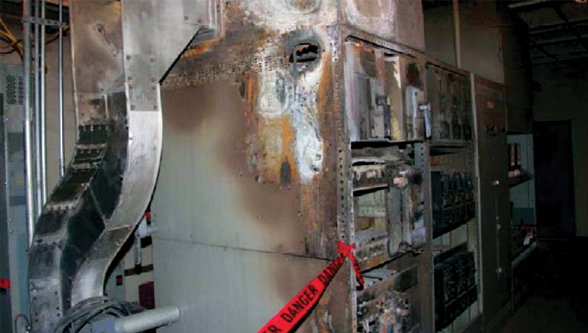 CNA Insurance uses the average electrical loss of €648,000 or the specific loss by type (circuit breakers, switchgear, or MCC rooms) for critical and serious faults discovered during the IR survey. If the fault is found on specialized equipment, they use specific replacement-cost information for the type or piece of equipment. Operating equipment until failure not only results in costly repairs, but can also prevent a facility from producing products, or may shut down a facility entirely. CNA’s reports include potential business interruption cost savings information associated when faults are proactively identified and corrected on critical equipment. CNA thermographers identified one or more critical or serious faults on 3,067 of the total surveys completed in a five-year period. If they apply the €648,000 average electrical fire estimate, that adds up to €2 billion in electrical fire losses avoided. Adding in the estimated costs of typical business and production interruption raises the total even higher. Most of these savings are realized by CNA Insurance, but the clients also benefit from avoiding the insurance policy deductible costs. IR thermography surveys have helped CNA to strengthen their risk management programs and integrate services that help protect lives, safeguard assets, and increase profitability.